The location is really good, its nearby Danube and the Parlament. Staff were very polite, location is great danube is 5min away. The location was good 10 mins walk to the parliament building and also close to Margaret Island. I like the location of the hostel. It is quite close to the parliament building, and to the river. Close to it, there are different restaurants, supermarkets and shops. The view and location was great, we also enjoyed the added feature of free entry to their club. The location was excellent. Best bed i have slept on when visiting Europe. Everything that i saw on the website was true. Friendliness of the staff and free entry to the bar right underneath it. I liked the whole concept of the hostel. Also there was really kind staff especially one receptionist (Zita Kondor). I'd love to come back as soon as possible. Great for couples, is a quite and clean place. The beds are very confortable and the rooms are beautiful. Excellent localization, with easy access to public transport and restaurants. The hostel is quite strategic you can just walk to some main attractions. I had a good morning walk to the bridge connecting budapest because it is not too far. The wifi connection is very strong anywhere in the hostel. The hostel also provides extra pillow and the bed was really comfortable. 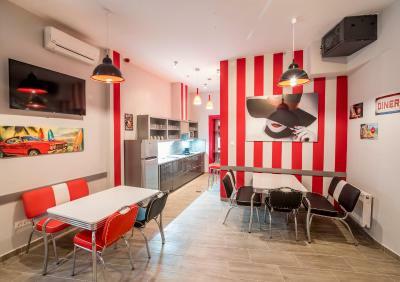 Centrally located in Budapest, 1,500 feet from the Nyugati Railway and Metro Station and just above the Morrison's Music Pub 2, Full Moon Design Hostel Budapest offers air-conditioned, rooms with attached bathroom, beds in dormitory rooms and free WiFi access. Each private room at Full Moon is equipped with a flat-screen smart TV. Each room and dormitory has an private bathroom. A spacious common room and a well-equipped shared kitchen are at guests’ disposal. The reception is open 24/7. Laundry facilities are available at an additional cost. The Full Moon hostel also provides a bar. Breakfast is available at an additional cost. Several supermarkets and a restaurants can be found within the immediate vicinity of the Full Moon Design Hostel Budapest. The Morrisons Music Pub 2 is located inside the same building. All guests benefit from free access to this music pub. The Jászai Mari tér Tram Stop is 650 feet away, where trams stop 24 hours a day (line 4 and 6). 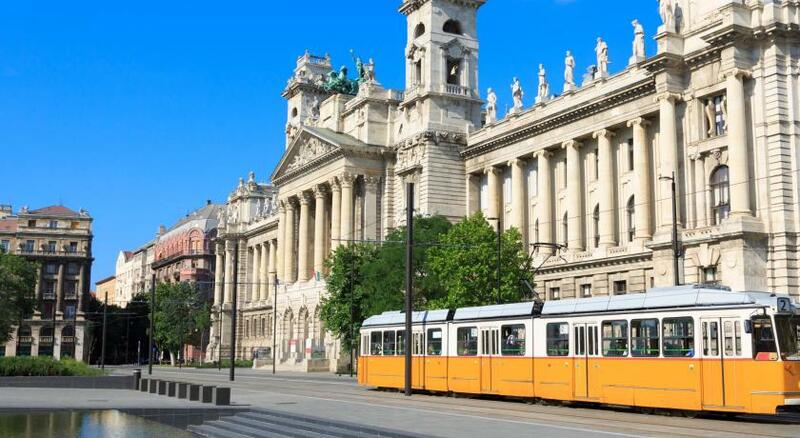 The hostel is 1,500 feet from the Margaret Island, 2,950 feet from the Parliament, 0.8 mi from the St. Stephen's Basilica and 0.9 mi from the Chain Bridge. The WestEnd City Center Shopping Center is 2,950 feet away. 05. Belváros - Lipótváros is a great choice for travelers interested in food, culture and history. 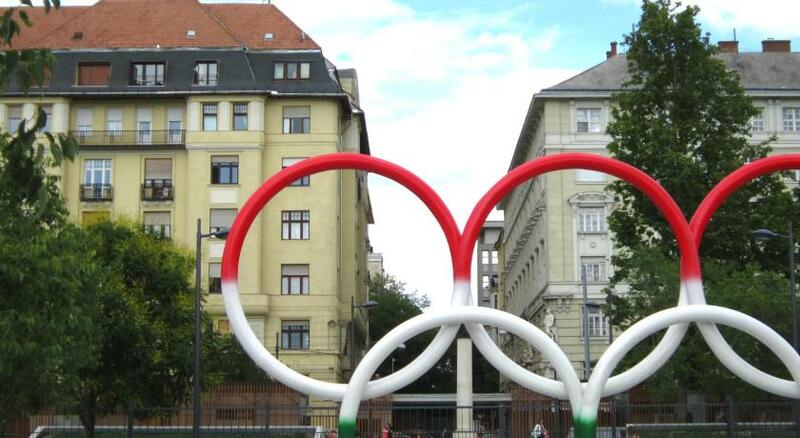 뀐 Located in the real heart of Budapest, this property has an excellent location score of 8.7! When would you like to stay at Full Moon Design Hostel Budapest? This dormitory room has air conditioning and a bathroom. Air-conditioned room with a flat-screen Smart TV and a private bathroom. The room is equipped with a private bathroom, a Smart TV and air-conditioning. Area Info – This neighborhood is a great choice for travelers interested in food, culture and history – Check location Great location - show map Guests loved walking around the neighborhood! House Rules Full Moon Design Hostel Budapest takes special requests – add in the next step! Full Moon Design Hostel Budapest accepts these cards and reserves the right to temporarily hold an amount prior to arrival. Please note that the hostel is located above a music pub. Noise disturbance can occur in the evenings in some rooms. Please contact the property in case you want to request a quiet room. You can use the Special Requests box when booking, or contact the property directly with the contact details provided in your confirmation. Unsecured! our room has no lock inside and one of the staff open the room without notice while we are in the room. And no any apologies. Check-in time was 3 pm but whe I arrived at hostel 6pm, it still didn't ready for getting the key. It's horrible how much noise there is. The party-hostel is a party hostel, means that you won't be able to sleep unless you are in the party which is hosted in the building. Location maybe great or good but there is no point of having a good location if the hostel is located in a 6 floor disco pub. I like that they did not make a long story out from our complain. There was no mattress on the bad, just some thin topper, bed was very hard. Thin pillows. Bathroom smelled bad all the time. Since there is a club - music is loud and you cannot hear it in the room which is fine, but you have to explain every time to the security staff at the entry of hostel that you just want to go to the hostel, not to the club and they are incredibly rude! They are the worst part! Staff is always friendly. Close to city center. We are here for the fourth time. It is above club - loud music all night and noisy people :(. Breakfast was so so. It's pretty loud even if you get a 'quite room', in the 3rd floor you can still hear the bass of the club downstairs (which is not a big deal for me) but also you hear the tram passing by and all the noises of a big street. The room was above a night club ..so it was a bit noisy for us ..